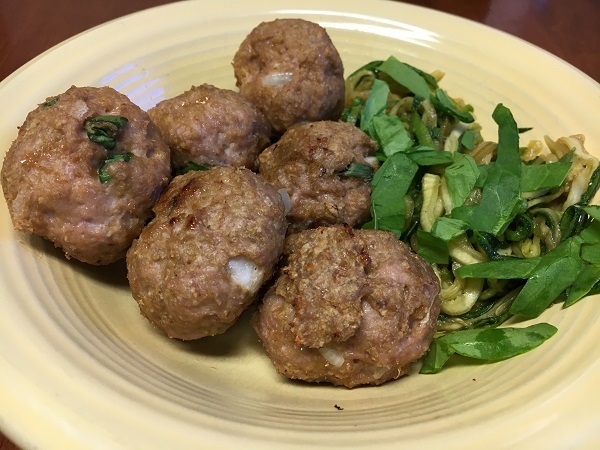 Turkey Meatballs with Zucchini Noodles – Marie, Let's Eat! One day I figured out that I’d feel a little better if we cut back on the carbs. I’ve been overweight since I was twelve, but always comfortable. Around the beginning of the year, I stopped being comfortable. I asked Marie for a little help. Not long ago, Grant decided we were eating way too much pasta. I still disagree, as there is no such thing as too much pasta, but have to concede that we have both lost a bit of weight since making the change so perhaps his notion was not altogether off base. Anyway, he’s been sending me ideas for pasta alternates, and I liked the look of this one by Valerie Azinge, author of the My Digital Kitchen blog. It’s actually intended to be paleo, and we don’t do paleo as a regular thing so I made a couple of shortcuts on her original recipe. Here it is, with the original link and my changes in brackets instead of parentheses as usual, because the author likes parentheses too. 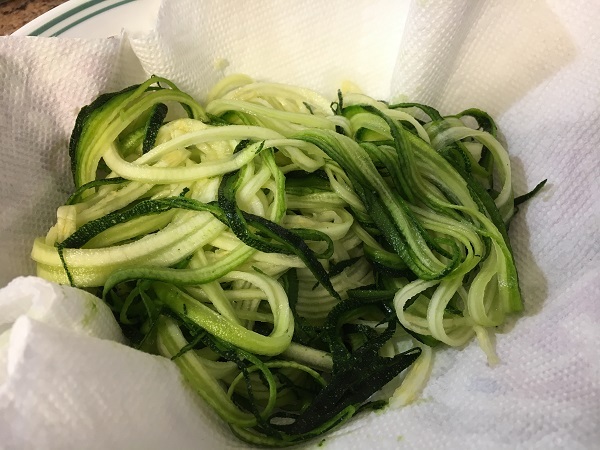 Sprinkle a pinch of salt on the zucchini and cover with another layer of paper towels, pressing down slightly. Let it rest for 30 minutes until most of the moisture is soaked out! Combine turkey, fish sauce, onions, garlic powder, spinach, almond meal, egg, curry paste and sriracha sauce in a bowl. Roll mixture into palm size meatballs and place 2 inches apart on a baking sheet [there is no need for this much space; they shrink while cooking]. Bake for 30 minutes [I checked after 25 because mine were a little smaller than the original called for, and found them done]. 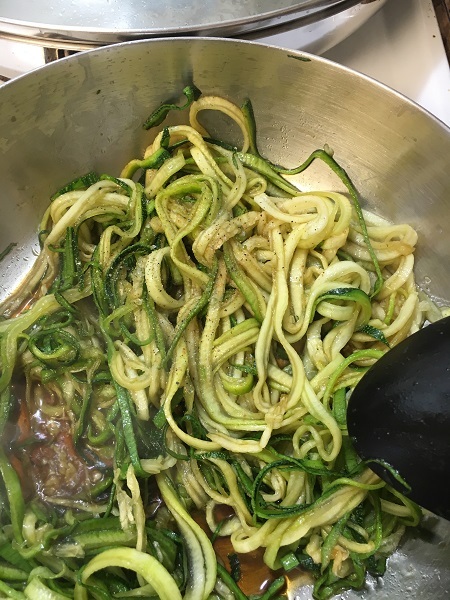 When ready, toss zucchini and soy sauce together [I sauteed the zoodles to warm them up and pull off a little more liquid but the original recipe called for them to be raw]. Serve with meatballs. 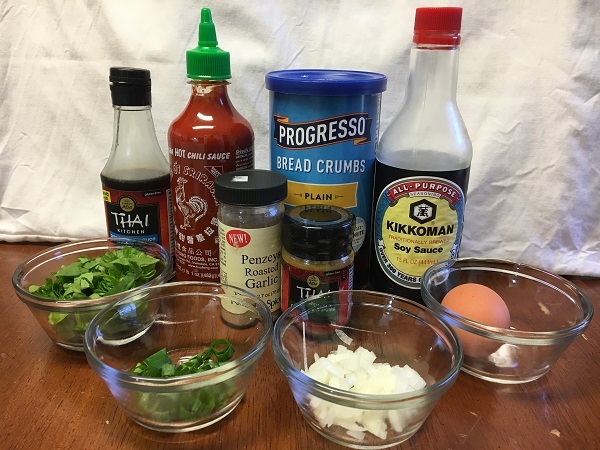 This is a fairly simple, easy, and tasty way to go low-carb. Recommended, and we’ll be making these again! Although I did have some regular meatballs and pasta in reserve for my unhappy boy after he made his obligatory taste of the new and unfamiliar, I think he could adjust to them.The curry adds a lot of flavor without making itself the center of attention, and the texture of the meatballs is good – substantial but not firm. Posted on June 15, 2017 by Grant G.Posted in marie writes, our kitchenTagged cooking, marie writes, our kitchen.